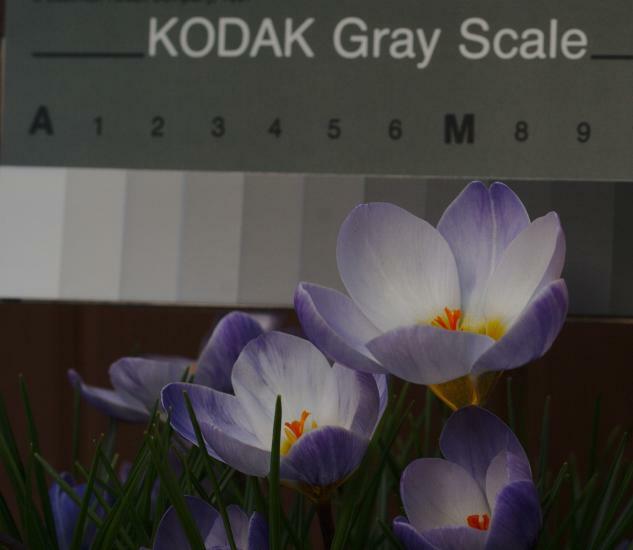 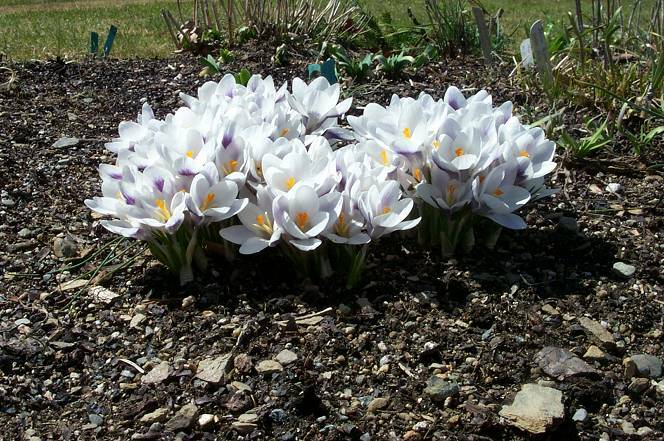 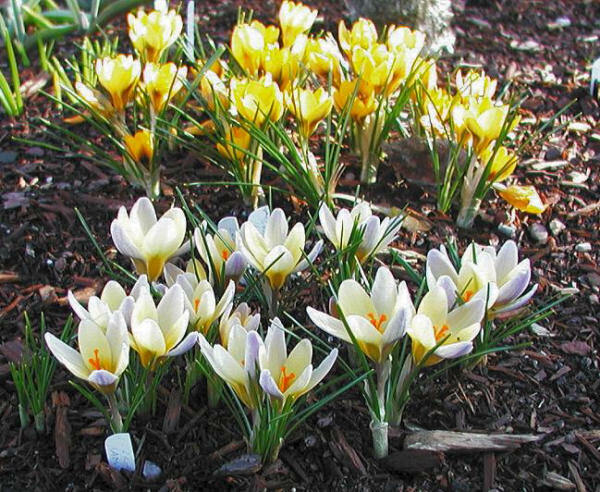 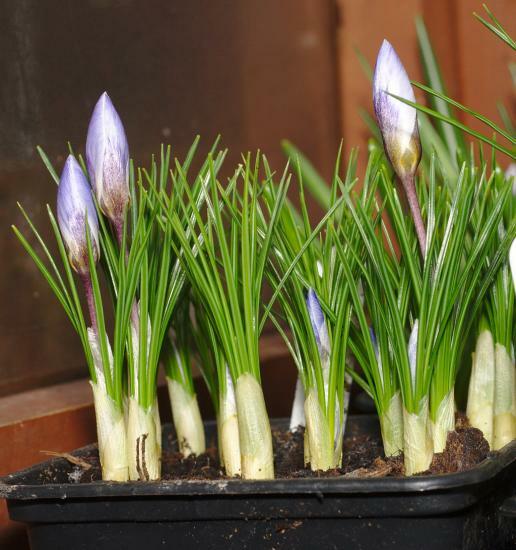 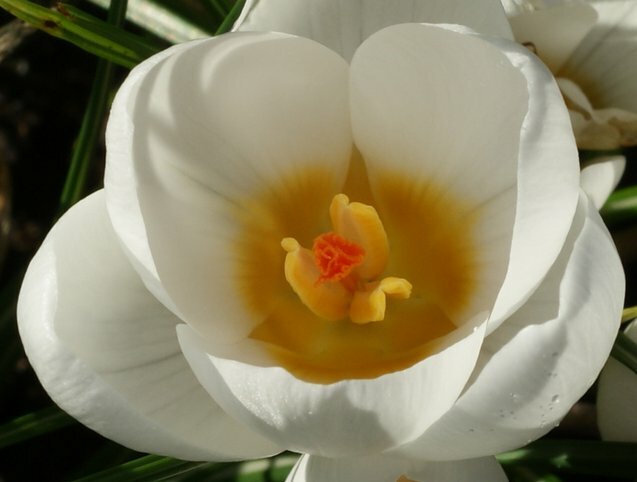 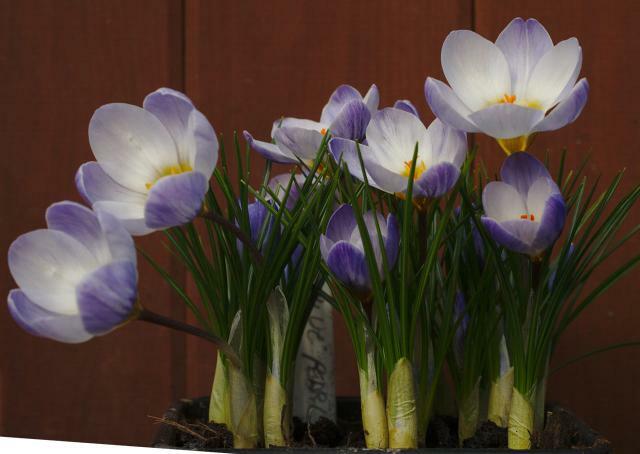 Crocus chrysanthus is commonly called the 'snow crocus' because it blooms so early in the year. 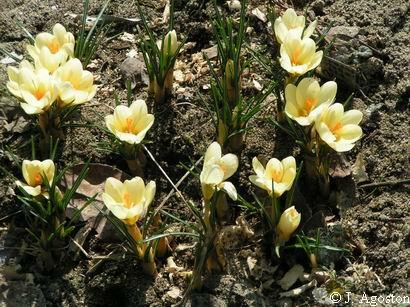 It is closely related to Crocus biflorus; some of the cultivars sold as Crocus chrysanthus are Crocus biflorus hybrids. 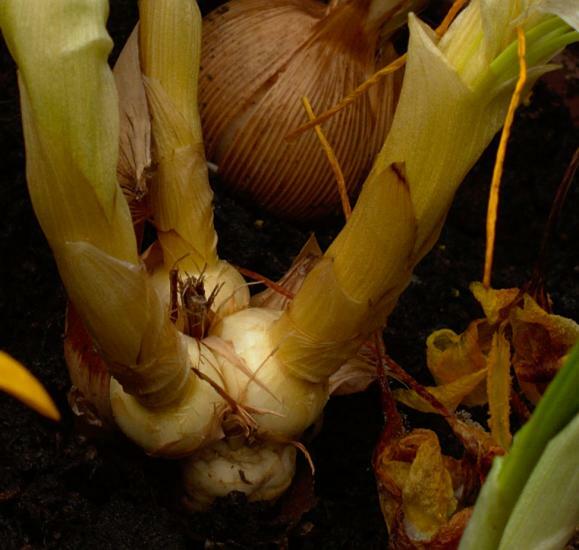 Tunics are coriaceous (looking like leather). 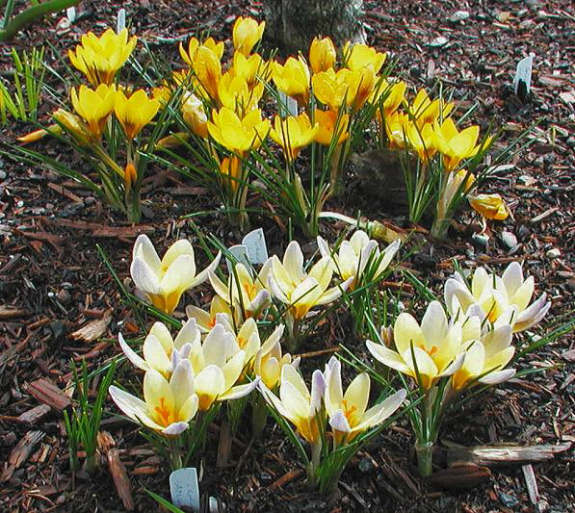 A useful reference is Compilation of Crocus Chrysanthus/Biflorus Cultivars by Thomas Huber. 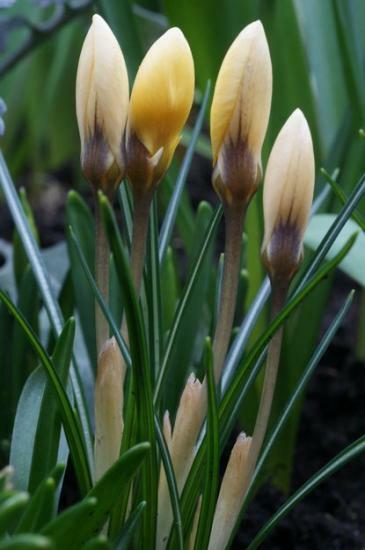 Photo 1 by John Lonsdale. 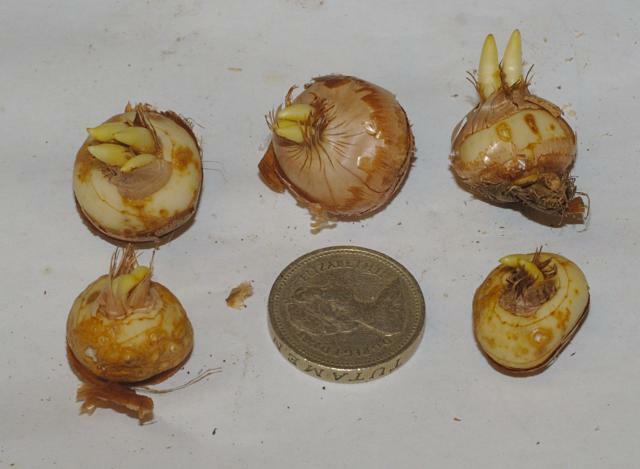 Photo 2 by David Pilling shows corms forming around shoots on top of old corm. 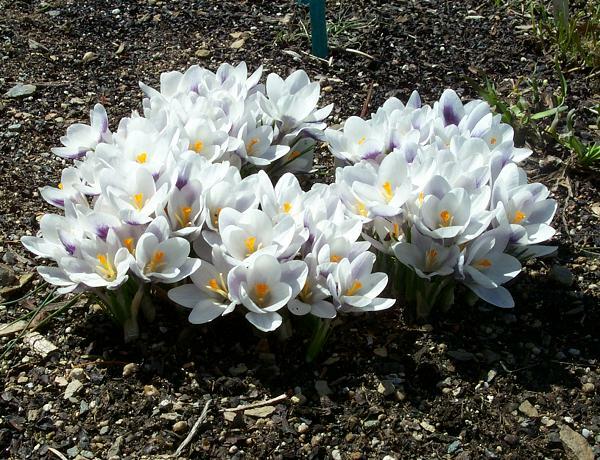 Crocus chrysanthus 'Advance' - Here are 4 photos of this stunning C. chrysanthus selection with bicolored flowers that are blush lilac on the exterior of the outer tepals, creamy white interior tepals, and soft moonlight yellow inside. 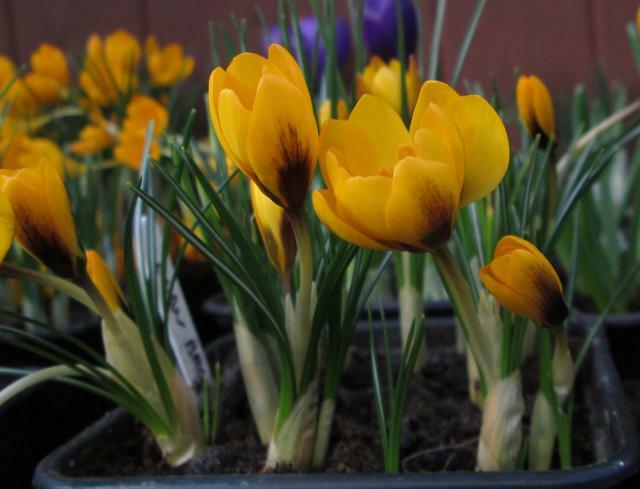 In each of these photos, one can also see the deep yellow flowers of another C. chrysanthus variety; 'Goldilocks', strikingly marked with dark purplish brown near the base. 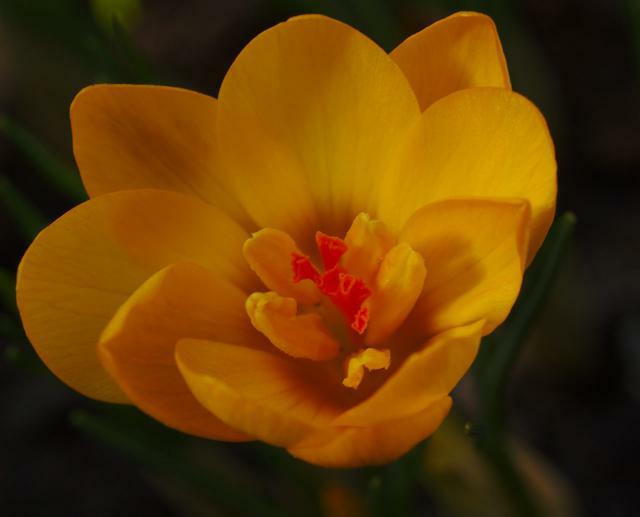 Photos by Mark McDonough. 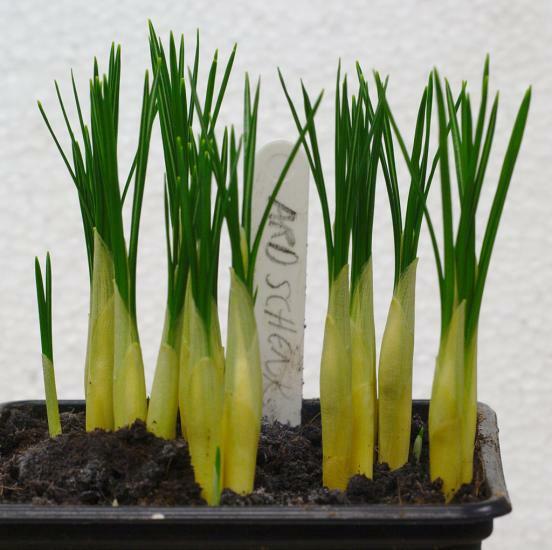 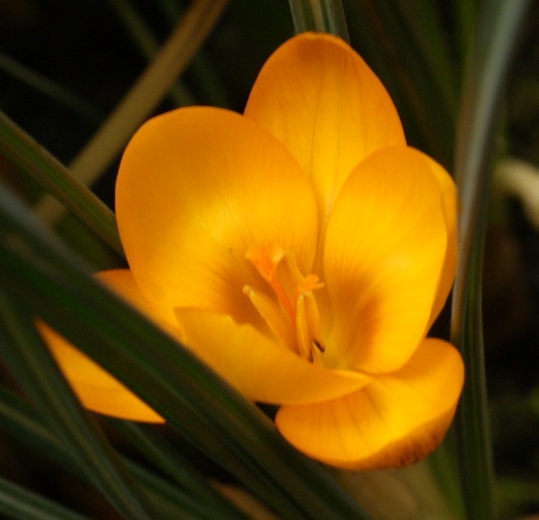 Crocus chrysanthus 'Ard Schenk' is named after a Dutch speed skater of the 1970's. 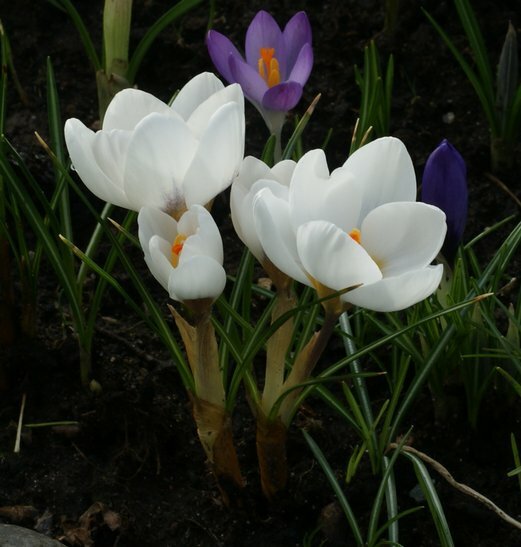 Photographs by David Pilling, in the last one Crocus tommasinianus is also visible. 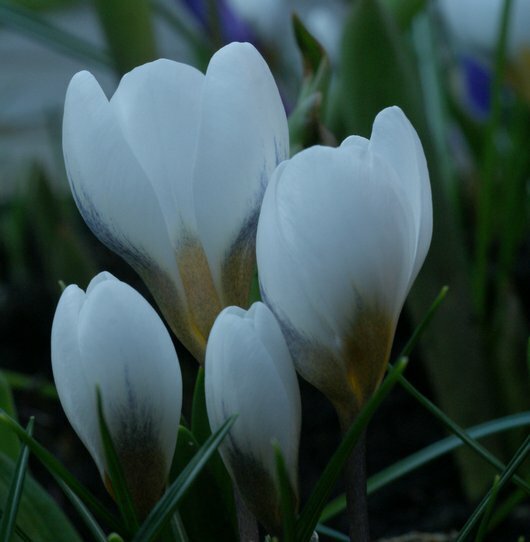 Crocus chrysanthus 'Blue Pearl' - Two photos of another excellent C. chrysanthus selection, this one a pale ice blue on the outside, even paler inside, with lovely goblet-shaped flowers. 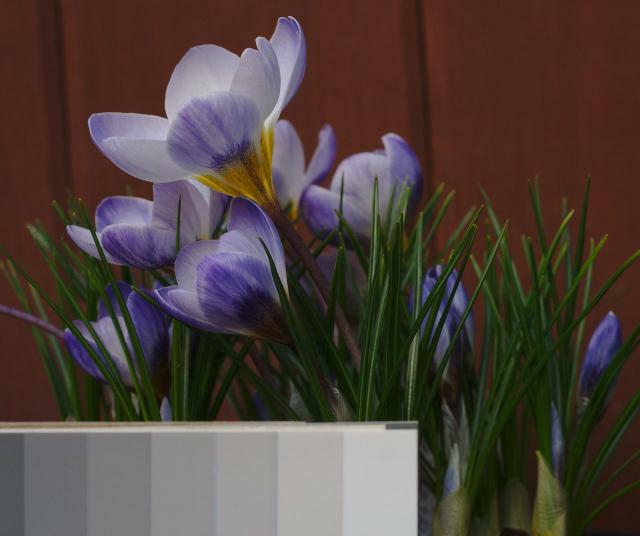 Floriferous and weather proof beauty. 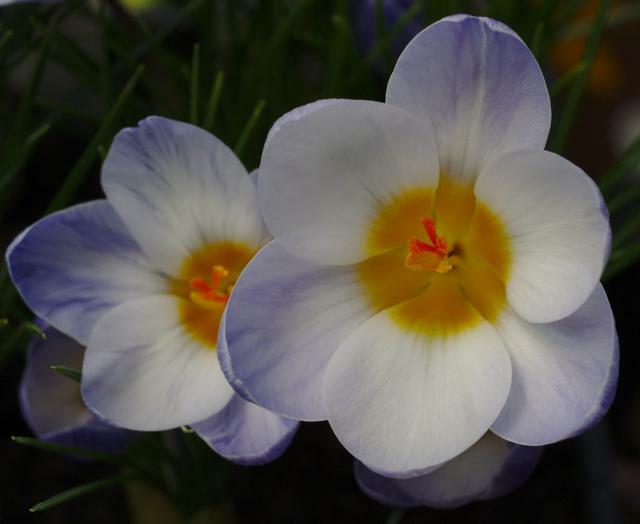 The flowers may appear white in the photo, because there isn't a truly white flower nearby, and the ethereal pale blue is hard to accurately capture in the photographs. 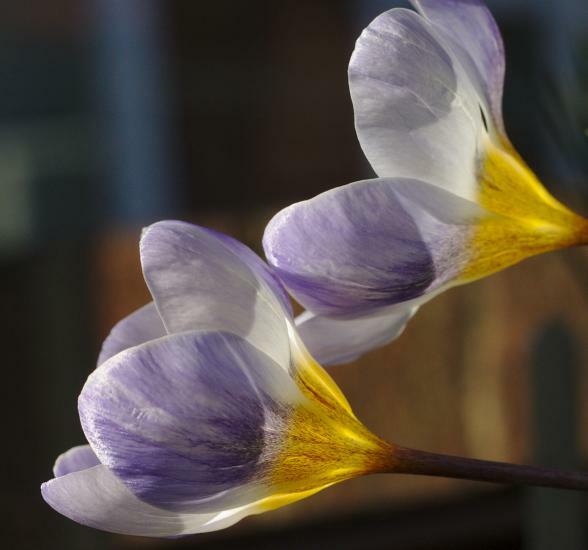 Both photos by Mark McDonough. 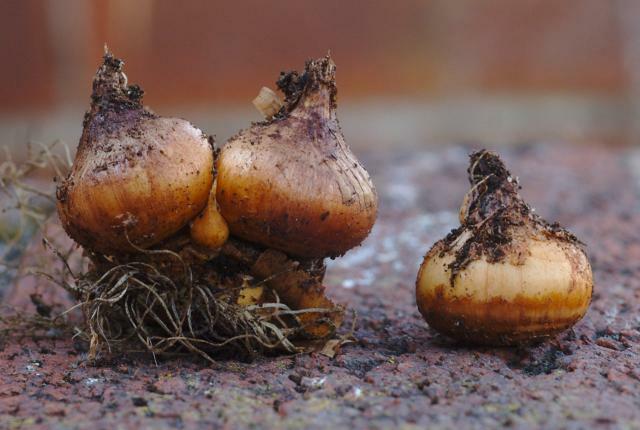 Photos of corms received as 'Blue Pearl' by David Pilling. 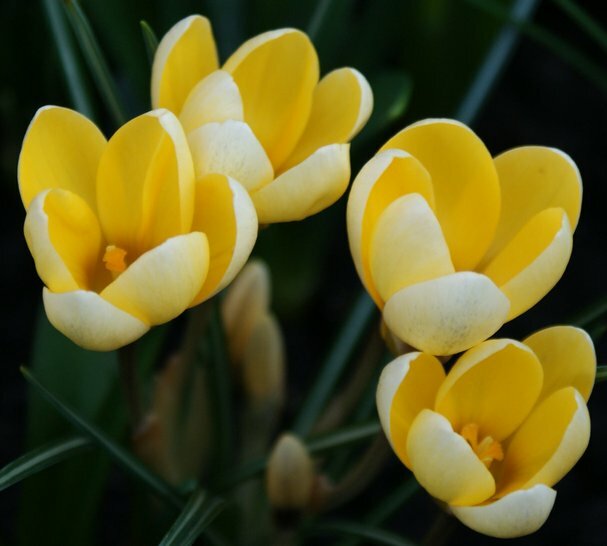 Crocus chrysanthus 'Cream Beauty' was described by John Grimshaw as a favorite yellow flower, a lovely soft creamy yellow that is particularly effective in the garden, showing up in dull weather. 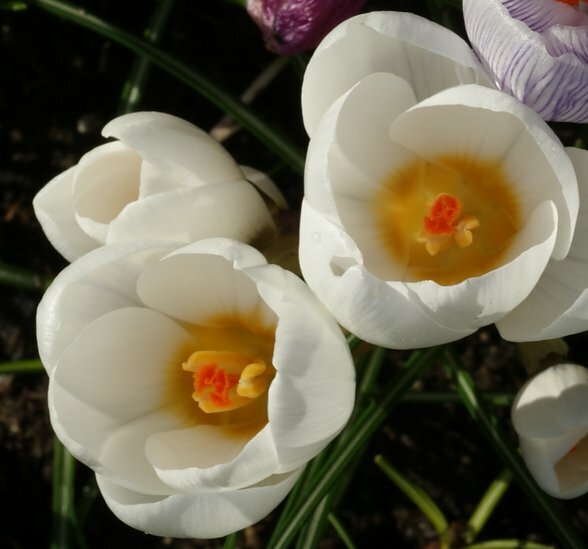 First photo by Janos Agoston; the second by David Pilling compares 'Cream Beauty' on the right with 'Romance'. 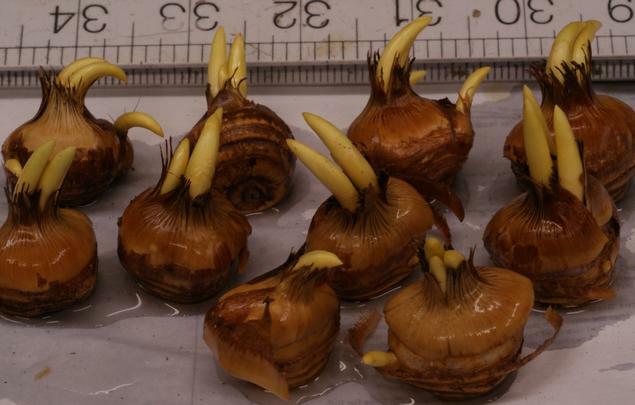 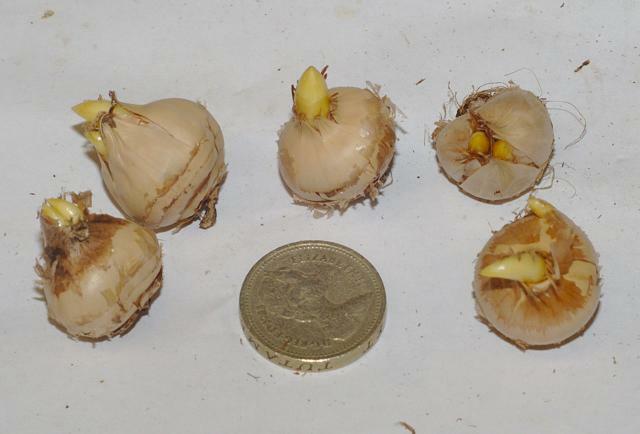 The third photo shows corms freshly removed from the ground at the end of June, showing that their appearance in these conditions is slightly different to the dried corms shown elsewhere on this page. 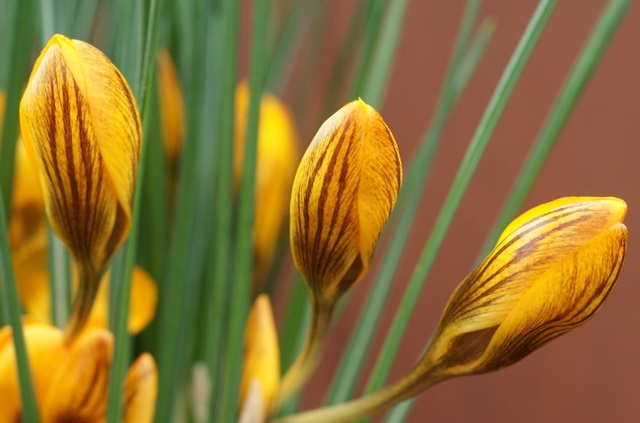 Crocus chrysanthus 'Dorothy' is similar to 'Fuscotinctus' (dark (fusco) tinged (tinctus)) but has black basal tips to the anthers, which are visible in the photographs by David Pilling. 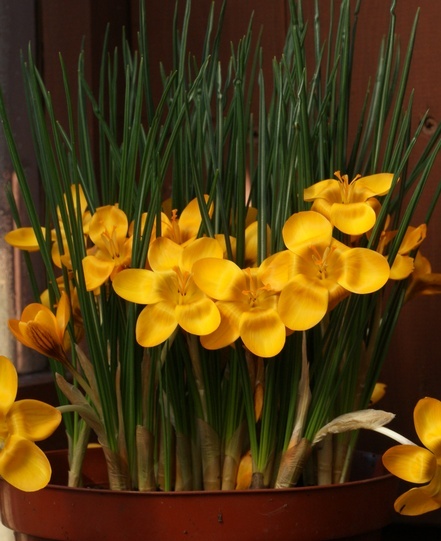 It was registered by Barr and Sons and has been grown since before 1940. 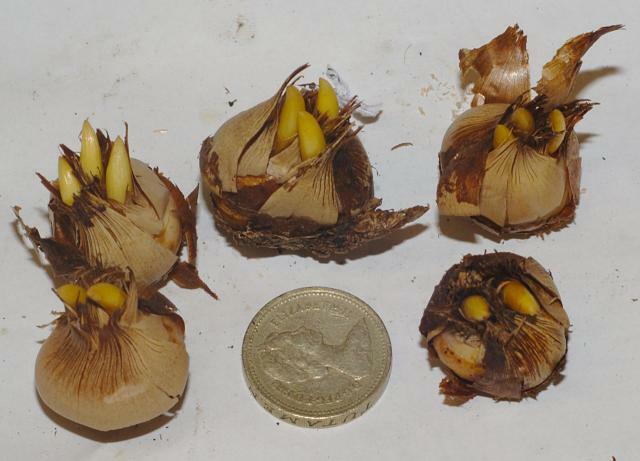 The last photo shows the characteristic banding (under the tunic) of all Crocus chrysanthus corms. 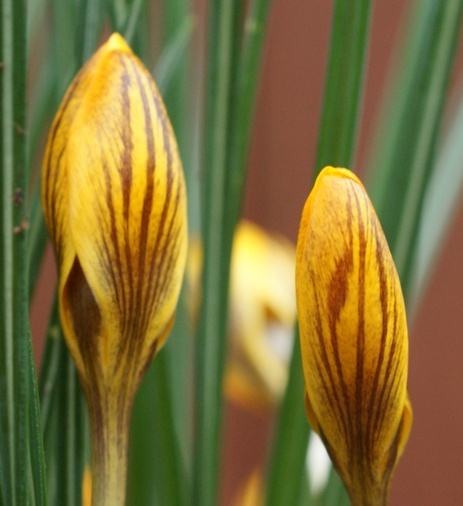 Crocus chrysanthus 'Goldilocks' - an old favorite, but still one of the best with deep yellow strikingly marked with dark purplish brown on the exterior. 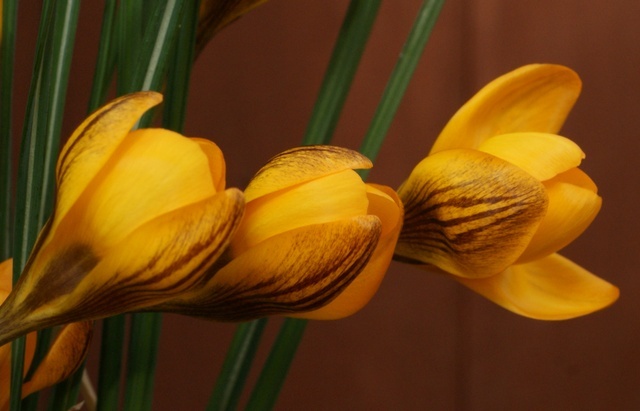 In the photo, the flowers are still closed, awaiting warmth and sunshine to open. 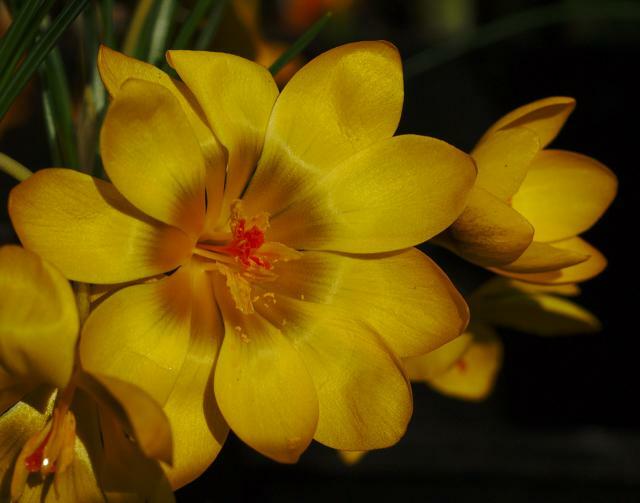 Also see the photos of C. chrysanthus 'Advance' above, which show 'Goldilocks' a couple weeks later and the flowers fully open. 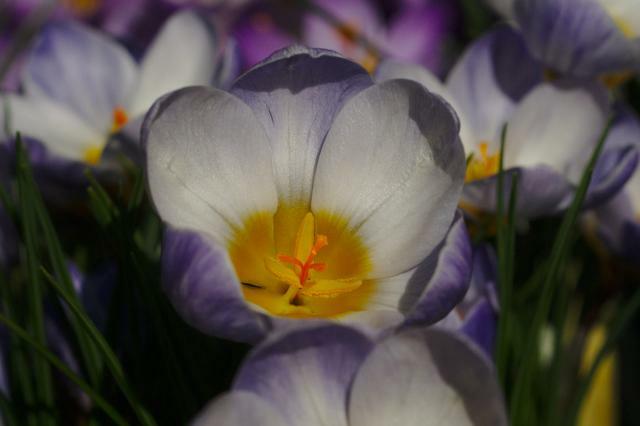 Photo by Mark McDonough. 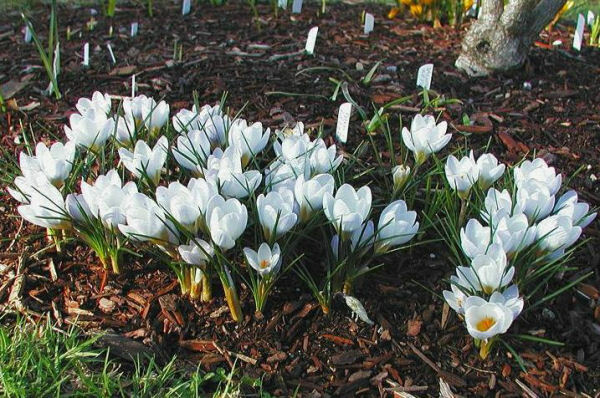 Crocus chrysanthus 'Prins Claus' - Perhaps my absolute favorite C. chrysanthus selection, this one has pristine white flowers marked deep purple on the outside. 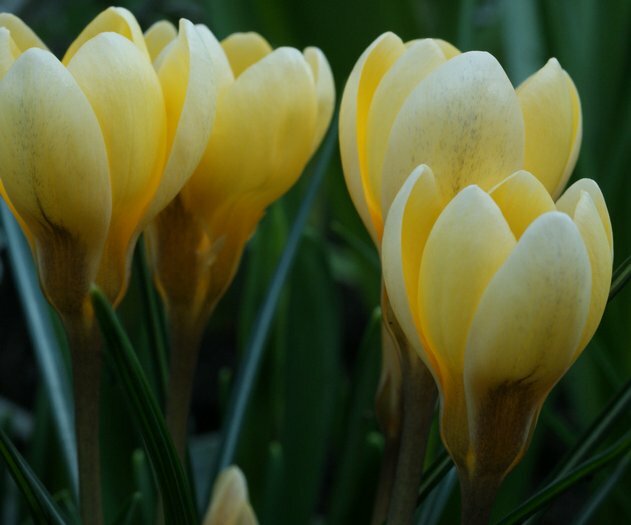 The sumptuous flowers are goblet-shaped with rounded tepals, wafting an enticing spicy-sweet scent. 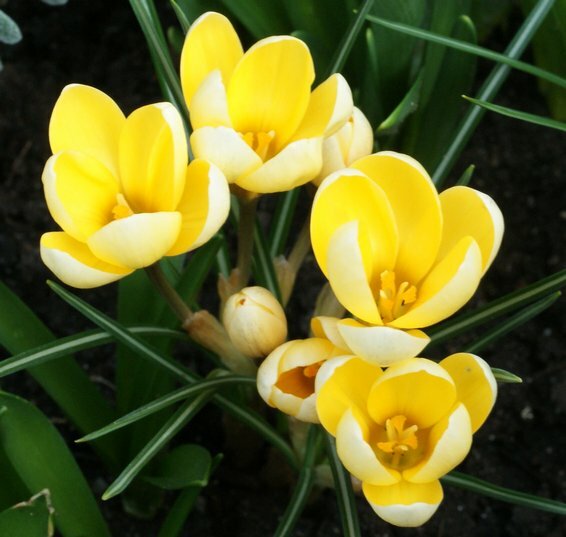 The four photos depict a clump that's about 10 years old in which there's barely enough space for the flowers to open. 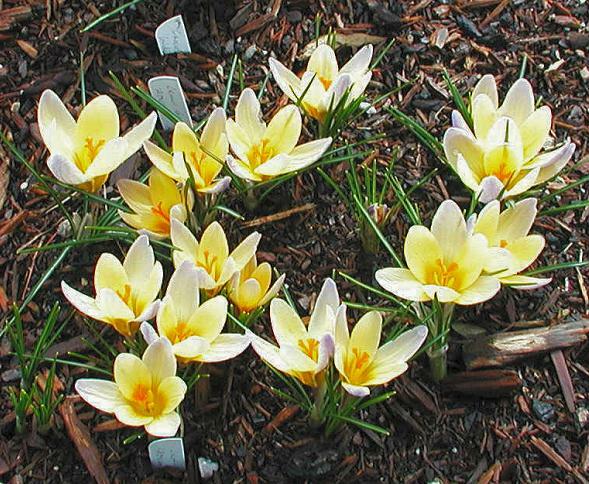 In many years the flowers are trashed by bad weather, but when they make it, it's worth the years of waiting. 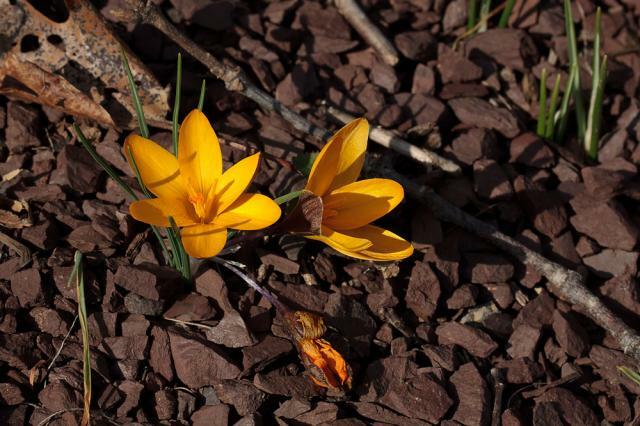 Photos by Mark McDonough. 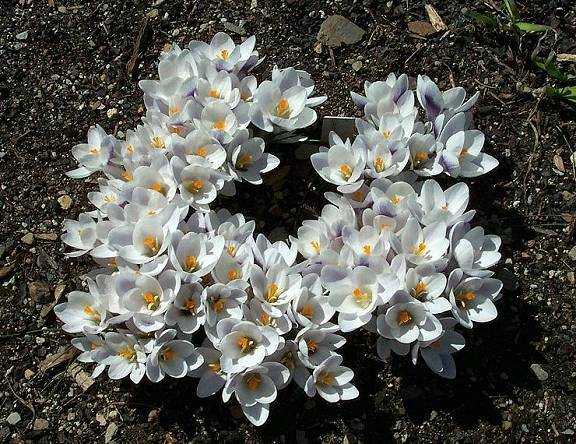 The last photograph is an overhead view of the floriferous clump taken March 29, 2003. 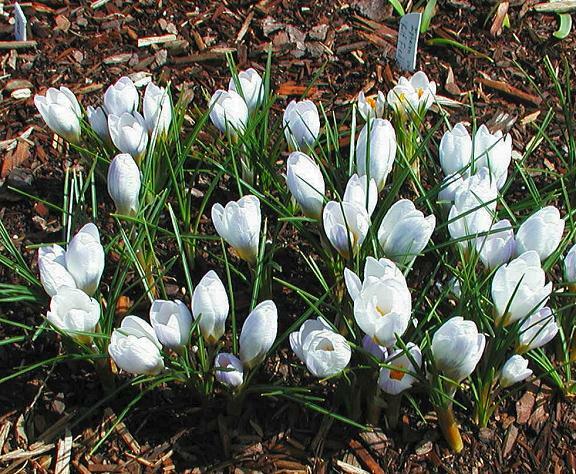 The day after taking this picture, it poured rain, followed by 1-1/2 weeks of ice, hail, snow, and more rain, which more or less finished off this year's display. 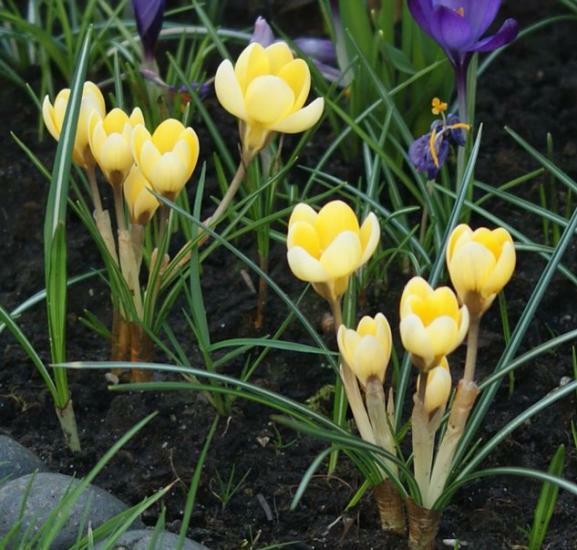 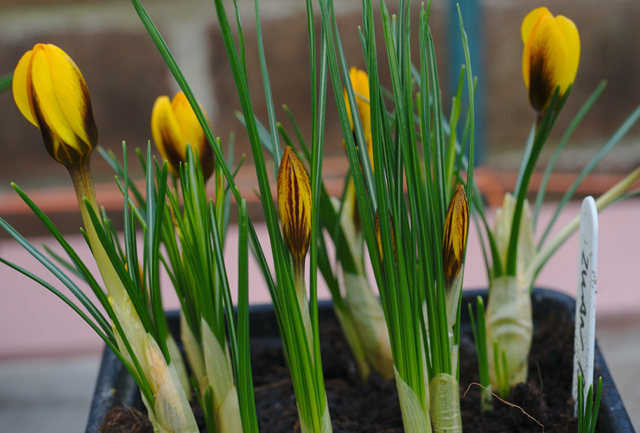 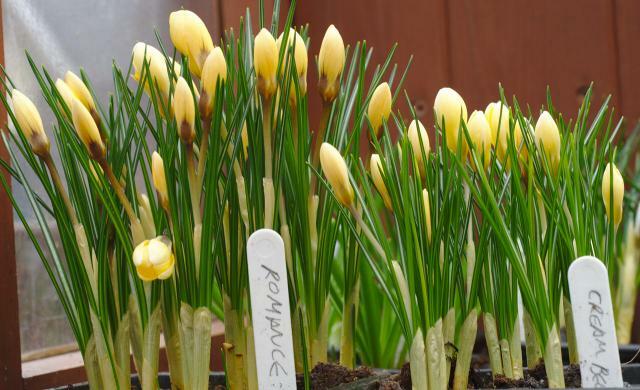 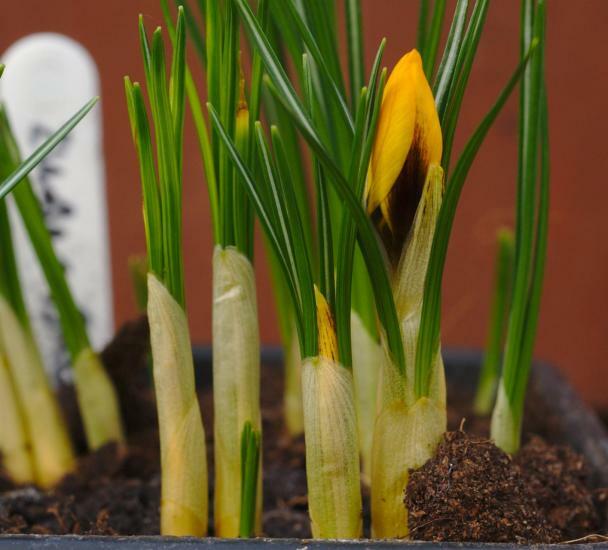 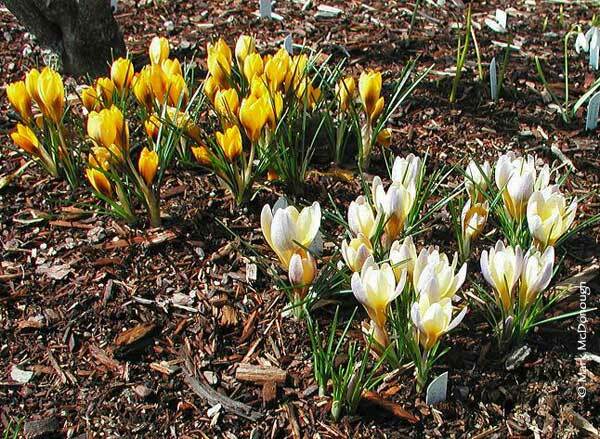 Crocus chrysanthus 'Romance' has a pale yellow outside and a dark yellow inside. 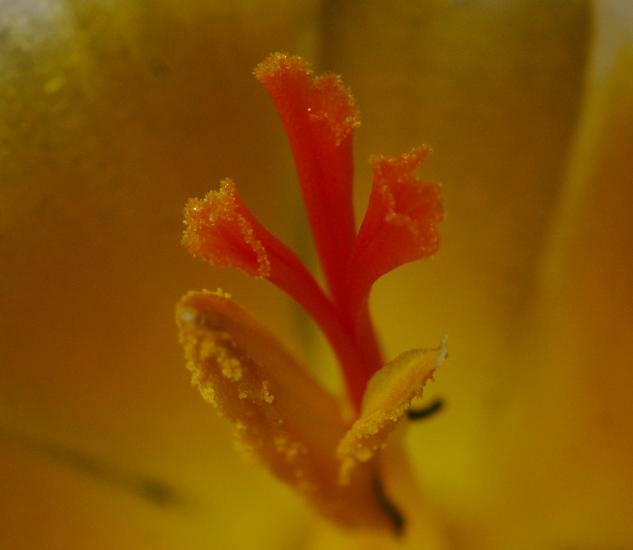 Photographs by David Pilling. 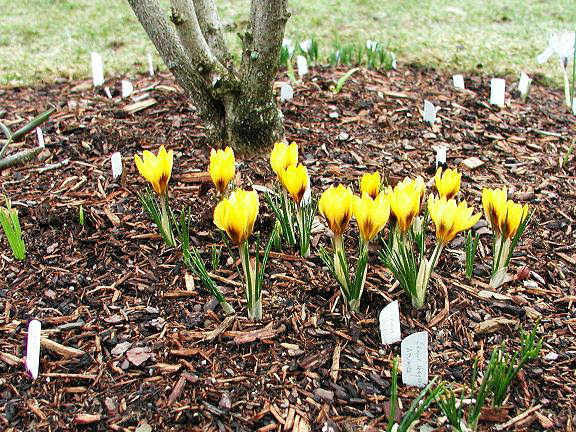 Crocus chrysanthus 'Zwanenberg Bronze' corms and resulting flowers photographed by David Pilling below were received as this cultivar; however, the only semi-double usually mentioned is Crocus chrysanthus 'Goldmine', so that is more likely what they may be. 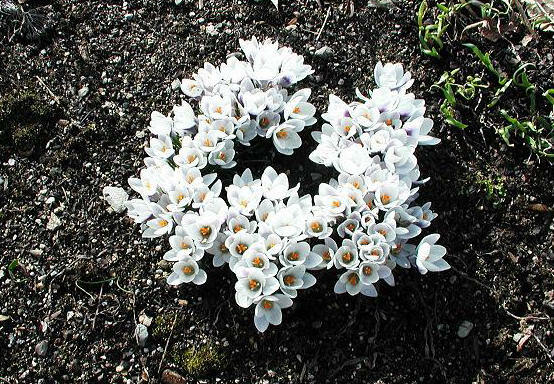 Not all the flowers were double.